Unless you've got a dud unit, the iPhone hardly ever has any really serious problems that can't be fixed by a few simple procedures (and most don't require you to reinstall your music or apps). It's just a fact that with so many incredible features, once in a while an app on the iPhone is going to get stuck – just like they do on Mac OS X or Windows. In this iPhone troubleshooting guide, we'll take you through the most common problems that can occur with the device and show you how to resolve them. So, whether you're having problems with 3G or SMS, booting or battery life, we're here to offer an answer to your SOS. We'll start with the easy way to cure most iPhone ailments in the form of restart, force quit, reset and restore, and then address other handy iPhone fixes. If your iPhone seems slow or sluggish in some of its operations (SMS typing, using Safari and even opening up apps), then a good old-fashioned restart is usually enough to sort everything out and get things working smoothly again. To restart, simply hold down the Sleep/Wake button on the top of the iPhone, wait for the Slide to power off message to appear – and then slide to turn the iPhone off. After the iPhone has switched off, press and hold the Sleep/Wake button until the Apple logo appears. Before the iPhone 3.0 software update, you could quit an individual application that had stopped responding by holding the Home button for at least six seconds, or until the application you were using quit. 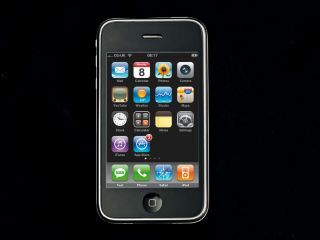 With the iPhone 3.0 software, pressing and holding the Home button activates Voice Control instead (on the iPhone 3GS). Now, to quit an app, first bring up the Slide to power off screen by holding the Sleep/Wake button, and then press and hold the Home button until the app quits (around six seconds). If your iPhone is constantly crashing, but you don't want to completely restore it to factory settings and then have to go through the process of resyncing everything, then it may be worth trying resetting it from the Settings menu. Go to the Home screen on your iPhone and choose Settings > General > Reset > Reset All Settings. This will clear all of the preferences but keep the content on your phone. You might find that's all you need. If an application has completely locked your iPhone and neither the force quit nor the restart methods shown opposite are working, then you can manually reset your iPhone by pressing and holding both the Home and Sleep/Wake buttons for at least 10 seconds, or until the Apple logo appears. It's quite rare that neither of the aforementioned tricks work, so you'll probably only need to go through this reset process once in a while, but it's still a handy technique to know, just in case. If all else fails and you want to take your iPhone back to its factory state, then the restore option is for you. You need to do this through iTunes. Connect your iPhone to your Mac or PC and click on the iPhone in the Devices list on the left-hand panel in iTunes. Click on Restore. If there's an available update, then your iPhone will be updated and all of your precious information, such as contacts, bookmarks and so on, will be backed up, so you can reinstate them to your device after the restore process has finished.